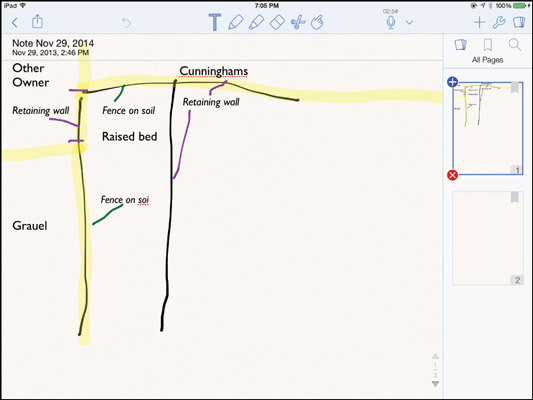 The $4.99 Notability lets you sketch and record audio in your notes to use your iPad for business. But Notability also lets you type via your onscreen keyboard. So, if you see yourself as a mostly typing kind of note taker, Notability is a good option. Notability can store notes to Box, Dropbox, Google Drive, and any storage server that uses the WebDAV protocol to provide file access. It also supports iCloud, so your notes are automatically available to your other iOS devices that have Notability installed. You set up your cloud storage accounts and turn on iCloud in the Settings window; in the main Notability screen (where your notes are listed), tap the gear icon. The Share icon in that main screen lets you email, print, and otherwise share your notes to or with other apps (via Open In), devices (via iTunes), and the supported cloud storage services. The Share icon is also available within a note to share that note. 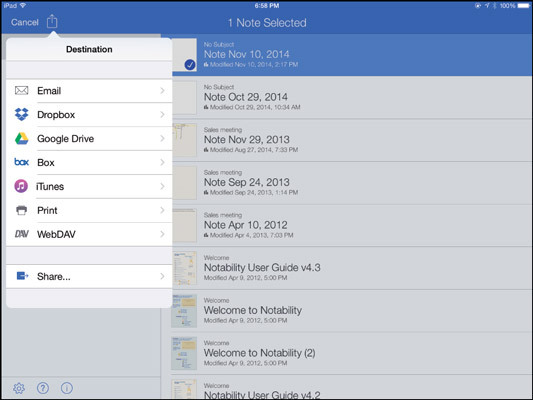 Notability has the concepts of dividers and subjects, which are basically ways to categorize your notes. A subject holds multiple notes, and a divider holds multiple subjects. To create a divider or subject, tap the + icon at the upper left of the main screen; then tap Create Subject or Create Divider, as desired. To create a note, tap its subject and then tap the pen icon at the upper right of the screen. To import a note from a cloud storage service, tap the Import button to the left of the pen icon. T: Activates the keyboard; tap it and then tap the screen to be able to type. The text begins at the far left of the screen and doesn’t wrap around any drawings. To create a text box that you can move and resize, tap and hold until the +Text Box menu appears; then tap it to create a text box to type in. Marker: Activates the highlight drawing mode. It works just like the Pen icon, except that the “ink” is translucent, so whatever is under what you draw with it is still visible. Unless you create a text box or use the drawing tool, text and drawings can’t be moved after they’ve been inserted. Eraser: Lets you erase an object by swiping over it. Scissors: Lets you draw a marquee around objects and then tap the screen to get a menu through which you can cut, copy, or delete the selection or apply a new “ink” color and/or thickness to it. Microphone: Lets you record audio to add to your note. Tap it to start recording; tap it again to stop. An indicator shows the total recording time for all the recordings in the current note. Each note can have multiple recordings attached to it. After you stop recording audio, an arrow icon appears next to the microphone; tap it to get playback controls as well as the gear icon, which opens a pop-over where you can manage (read: delete) recordings. + (plus sign): Lets you insert images from the Photos app; a photo taken by the iPad’s camera; a drawing (called a figure) that you can move within the note; and a web clip (a screen shot of a web page that you can tap to open the actual web page). This icon also lets you add sticky notes. Pages: Lets you show or hide a list of pages for the current note. To return to the main screen, tap the Back button (the < icon) at the upper left of the screen. Your notes are saved automatically as you work on them.